Our Biogen Stock Prediction in 2019 (Up or Down)? Multiple sclerosis, commonly referred to as MS, is a debilitating disease of the central nervous system. MS affects about 2.3 million people worldwide. Symptoms can range from tingling and numbness to blindness and paralysis. They can vary greatly from one patient to another, and sometimes even in the same patient over time. It’s difficult to predict how the disease will progress and affect a patient. There is no cure for MS, but fortunately, advances in treatment have helped control the disease. Today we look at the company leading the fight against MS: Biogen (NSDQ: BIIB). The efforts of this biotechnology giant could improve patient lives — and at the same time reward shareholders. With a market cap of $67 billion, Biogen is a biotech that focuses on neurological diseases, especially MS. The company generated about $13 billion in revenue in 2018. The company’s MS portfolio includes three blockbuster drugs: Tecfidera, Avonex, and Tysabri. A blockbuster drug is one that generates at least $1 billion in sales per year. Biogen’s current growth driver is Spinraza, which treats spinal muscular atrophy (SMA). 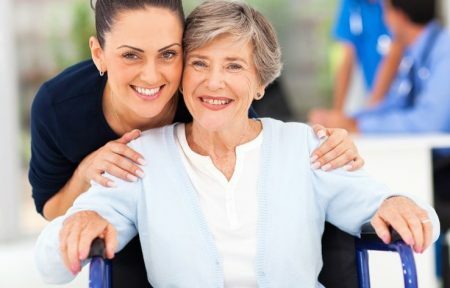 Approved by the U.S. Food and Drug Administration (FDA) in late 2016, Spinraza got out of the gate quickly and has already joined the blockbuster club in 2018, its first full year on the market. Biogen has a deep pipeline, with more than 20 programs in various stages of development. The most intriguing area is Alzheimer’s. The disease afflicts about 5.7 million Americans, with no drug currently available to even slow disease progression. Biogen has two drug candidates in Phase 3 clinical trials and two more in Phase 2. If the company can bring to market the first FDA-approved drug to treat Alzheimer’s, it would be akin to finding the Holy Grail. How Has Biogen Stock Performed? Tysabri is one of the most effective MS treatments. However, the drug is associated with a rare but potentially deadly brain infection called PML. Biogen found that patients who test positive for a certain virus were more likely to develop PML. This allowed Biogen to target MS patients with the lowest risk for developing PML, which helped Tysabri sales grow. At the same time, as excitement built over Tecfidera, which showed excellent efficacy and safety in clinical trials, the stock price shot up. When finally approved in 2013, Tecfidera hit the ground running. By the end of 2014, Tecfidera’s first full year on the market, Biogen’s sales had increased by 76% compared to 2012, thanks to a $2.9 billion contribution from Tecfidera. Although Tecfidera sales grew to $4.2 billion in 2017, the growth rate had slowed. In October 2014 the first case of PML in a Tecfidera patient was reported. Less than a year later, a second PML case was confirmed. In 2018 Tecfidera sales will likely be essentially flat (final figures aren’t available yet). The slowdown in Tecfidera sales explains the sudden fall in Biogen’s stock price in early 2015. 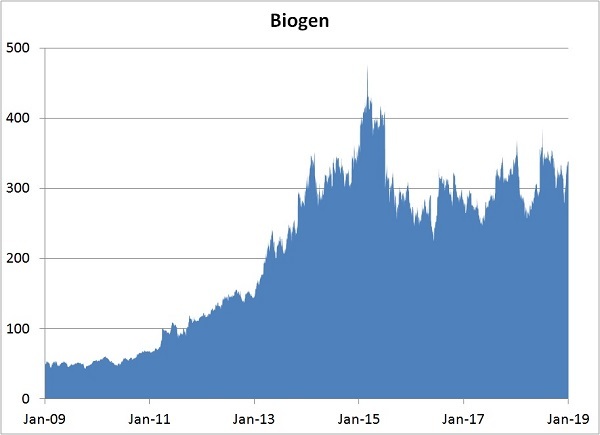 How Has Biogen Stock Performed In 2017/2018? The chart below depicts the stock’s performance from 2017 to 2019. The stock is up year-to-date, but in 2017 and 2018, BIIB was only about breakeven. Tecfidera’s run did not last as long as the company had hoped in the drug’s early days. Today, Spinraza has replaced Tecfidera as the main growth driver. Competition has eaten into sales of Tysabri and Avonex. Two separate clinical studies to expand Tysabri’s label also failed, which limits Tysabri’s upside. Overall, the company’s sales growth has slowed to under 10%. In Tecfidera’s first two years on the market, 2013 and 2014, sales grew at 26% and 40%. Novartis is a Swiss pharmaceutical company with more than $50 billion a year in sales. The company’s Gilenya is a direct competitor to Tecfidera. Gilenya enjoys the distinction of being the first FDA-approved oral MS drug (2010). Today, it trails Tecfidera by about $1 billion in annual sales. A recent study that looked at patients treated with the two drugs in two centers concluded that the drugs were about equally effective. However, patients seemed to tolerate Gilenya better and discontinued Tecfidera at a higher rate. Most common side effects for Tecfidera patients were nausea, diarrhea, and vomiting. For Gilenya patients, it was respiratory tract infections, headaches and back pain. A small number of Gilenya patients has also developed PML. In 2018, the FDA approved Gilenya to treat relapsing MS in children 10 years and older. It’s the first drug to win FDA approval to treat MS in pediatric patients. Novartis has also submitted a gene therapy to treat SMA for FDA approval. If approved, it would challenge Biogen’s Spinraza. Sanofi is also a European (French) drug company. Sanofi’s Aubagio was the second MS oral pill to be approved by the FDA, in 2012. At less than $2 billion a year, Aubagio trails behind both Tecfidera and Gilenya in sales, but now it’s the fastest growing of the three. Aubagio didn’t get much fanfare because there was more excitement over Tecfidera, which was approved right on its heels. However, Sanofi ran two additional studies after Aubagio was already on the market, which helped to affirm its effectiveness and safety. The drug is picking up some patients who can’t tolerate Tecfidera or Gilenya. Roche is yet another large European drug company with a hand in the MS market. Like Novartis, it’s Swiss. Ocrevus is the first drug to be approved to treat a rare form of MS called Primary Progressive MS (PPMS). Like other MS drugs, Ocrevus also treats the more common relapsing type. The distinctive feature is that patients only need to receive a dose once every six months. In PPMS, there’s no break in the symptoms. The patient experiences a steady worsening of symptoms. Ocrevus is not an oral pill. It’s given as an IV infusion, so it more directly competes with Biogen’s Tysabri and Avonex. It has had a direct hand in Tysabri and Avonex’s falling sales. There’s a silver lining for Biogen though: it gets royalties for Ocrevus sales. Biogen co-developed Ocrevus and has rights to future royalties. It receives 3% of Ocrevus sales outside of the U.S., but between 13.5% to 24% of U.S. sales. In the third quarter, Biogen received $130 million in royalties from Sanofi, which partly offsets sales lost to Ocrevus. The three aforementioned biotech players are major rivals to Biogen, but not the only ones, of course. The industry is rife with formidable competitors. Will Biogen Stock Go Up In 2019 (Should You Buy)? Two of Biogen’s Alzheimer’s candidates seem particularly intriguing. Aducanumab is in Phase 3 studies and BAN2401 is in Phase 2. Biogen is co-developing both with Japanese company Eisai (OTC: ESALY). Both drugs work by targeting plaque that typically builds up in Alzheimer’s patients’ brains and both drugs have shown evidence that they slowed progression in patients in the early stage of the disease. However, the quality of the data in both studies isn’t great enough to say that the drugs are destined for approval. Both are probably 50/50 shots to gain eventual FDA approval. However, if either one does make it to market, it will likely be a multi-billion-dollar blockbuster. As we’ve explained in previous articles, drug firms can live or die by FDA decisions. 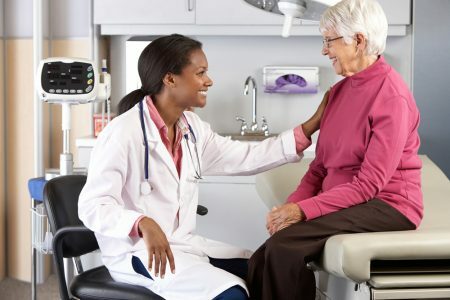 Aducanumab Phase 3 data readout is expected in 2020, while Biogen and Eisai are working with regulators on the design of Phase 3 study for BAN2401. If aducanumab successfully made it to market, Biogen would receive 55% of the potential profit in the U.S., 68.5% in Europe, and 20% of the potential profits in Asia except China and South Korea. The companies would have a co-promotion 50/50 split in the rest of the world. For BAN2401, profits would be split equally. Additionally, Biogen is working with Alkermes (NSDQ: ALKS) on Vumerity, an oral MS drug similar to Tecfidera but with less gastrointestinal side effects associated with Tecfidera. Alkermes has submitted an application to the FDA for approval of Vumerity. This could be another blockbuster to complement Biogen’s MS franchise. 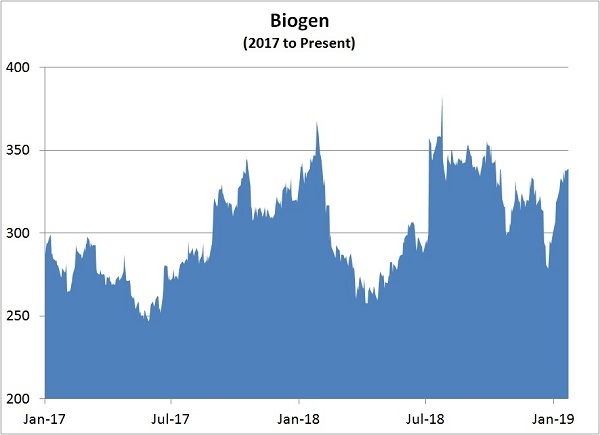 Will Biogen Stock Go Down In 2019 (Should You Sell)? Lately, a number of other drug companies have given up on their Alzheimer’s late-stage programs. Alzheimer’s has proven to be a very difficult nut to crack. Biogen’s two most promising programs are still standing, but they could end up failing like the others. The company’s MS franchise is solid, but competition is increasing. Even if approved, Vumerity may end up cannibalizing Tecfidera sales more than it takes market share from other companies’ MS drugs, so the net potential increase in sales is unclear. Recent sales trends show that Biogen’s core MS drugs are slowing or declining. Spinraza is the company’s only significantly growing drug right now. Competing drugs to Spinraza could hit the market soon. One is under FDA review and another is in Phase 3 clinical trials. Despite valid concerns about growth, Biogen’s sales are likely to continue to grow, even if at a relatively slow pace. Biogen has about $4 billion in cash and short-term investments on hand, and it generates almost $4 billion a year in free cash flow. It’s been using some of that cash to buy back shares, which helps to support earnings per share by reducing the share count even if profits aren’t greatly increasing. Shares are trading at about 12-times projected 2020 earnings, which reflects the low market expectations for growth, but it also leaves room for upside surprise. Watch for sales trends in 2019. As long as Biogen’s sales stay on a modest growth trajectory, the stock should rack up a solid performance in 2019. Positive updates to programs in the pipeline, especially the much-anticipated Alzheimer’s trials, could trigger a spike in the share price. As I’ve just explained, Biogen’s stock could enjoy an upside surprise. But if you’d like a steadier way to make money, without the market roller-coaster rides, I invite you to sign up for our “Total Profits Summit.” The summit will be hosted by my colleague, the legendary investment adviser Jim Fink. On Tuesday, January 29, you’ll see how Jim’s breakthrough investment system pinpoints stocks on the verge of shooting up 1,000%. You’ll also get details on three opportunities that Jim’s system just singled out. Each of these tiny companies has the potential to turn $10,000 into $110,000, or more. Spaces are limited; don’t miss your spot. Click here now to join our summit.